Functions may also be executed using [[spawn_args|spawn]], but then the function result is not accessible, making it behave more like a procedure. Spawned functions will run asynchronously or ''alongside'' the executing instance. This helps prevent large CPU intensive functions from seizing up the game. 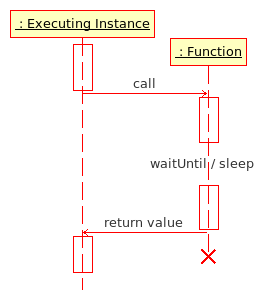 Functions may also be executed using [[spawn]], but then the function result is not accessible, making it behave more like a procedure. Spawned functions will run asynchronously or ''alongside'' the executing instance. This helps prevent large CPU intensive functions from seizing up the game. Functions are first loaded as String from a file via preprocessFile or loadFile. They are then executed via the call or spawn command. Since Armed Assault the loaded String needs to be compiled in order to convert it to Code, which is requried for call or spawn.